The Capisco task chair by HÅG is one of a kind. The shape of this task chair is quite different from any other task chair out there. Inspired by the movement and form of the human body, the Capisco offers a new way to sit fit and active. The unique saddle shaped seat gives endless options for this chair; sit in it chair backwards, sideways, kneeling, and anything else you can manage. 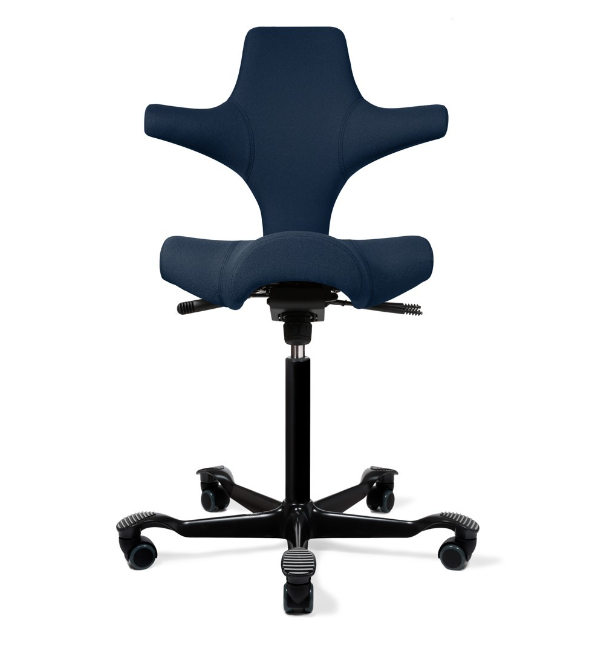 Adjustments included in the Capisco are: seat depth, seat height, back height, tilt tension backwards, and three position tilt lock. Sitting or standing, the Capisco will always move with you. Coming with 11 different options for types of fabrics, and over 50 different options for colors, there’s sure to be a Capisco that will fit your office or home. Need another reason to love this unique chair? It’s made from 50% recycled material and is 90% recyclable. We enjoy having this chair in the office for a break from the norm. It offers back relief and gets you out of your rut with uncomfortable seating positions.